Housing Market Shows a Sharp Monthly Change-Prices Up! 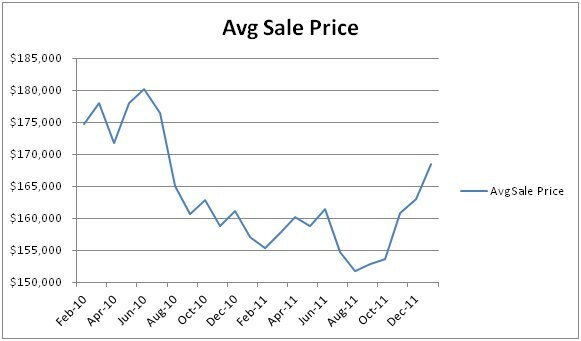 Average Sales Price: The sale price graph show a steady and rapid improvement since August of last year. The Average Sales Price went up 3.3% in January after a 1.5% jump in December. Overall the Average list price is up 10.9 % since August of 2011. Amazing statistic and completely contrary to what you hear on the national media. My theory is Phoenix was one of the first markets to go into the slump and one of the hardest hit so it should be one of the first to bottom out (I believe we hit the bottom last August). It is logical to assume that as one of the first markets in, we should be one of the first markets out of the slump. 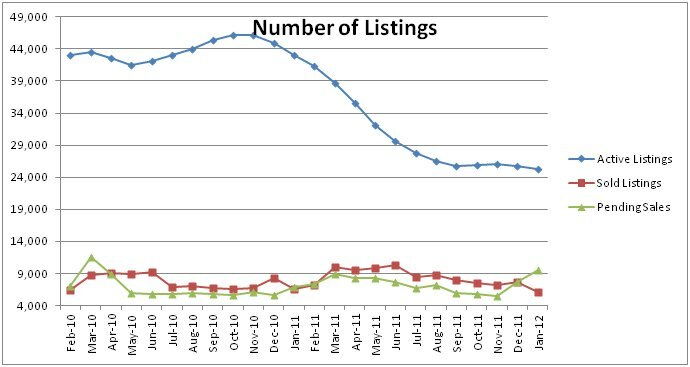 New Listings to the Market: January saw 9693 new listing come into the market. An increase of 28% from December. This is a common jump in new listings when compared with prior years and represents pent up listings that were withheld from the market for the holidays. Percentages of the Market: Real Estate Owned (REOs or Bank Owned) dropped 16% but still accounted for 28% of the market down a bit, Short sales dropped 23% but still accounted for 29% of the market which is down a bit and Non-Distressed or Regular sales dropped 18% but still accounting for 41% of total sales which seems ridiculously high when compared to what I see on a day to day basis but remains unchanged from December. This Regular sale statistic incorporates fix and flip properties artificially inflating the number of non-distressed sales. Sales per Month: 5728 in January down from 7,416 in December - or down 23% from December. This again reflects a normal annual trend. Just as the number of sellers decrease in Holiday season so does the number of closings. Active Listings (including AWC): 25,285 on February 1st down from 25,756 on January 1st - or down 1.8% from January 1st. Active Listings (excluding AWC): 17692 on February 1st - down from 18,320 down from January 1st or a 3.4% drop . The discrepancy in this percentage verus overall actives is probably due to the lack of working days to process short sales in November and December resulting in some of the homes lingering in AWC status. Pending Sales: 9510 on February 1st up from 9,146 or an increase of 3.7%. January was one of the most competitive markets I have ever witnessed to get homes in contract for my buyers. Every contract I submitted in January ended up in a multiple offer situation. Fortunately, I have a few secret tips for getting my offers accepted. Days Inventory: Increases significantly to over 90 days but I believe this to be is a result of the seasonally normal influx of new listings which from my own observations are begin gobbled up. Sales Price as a Percentage of List: 99% on February 1st. This stat means that most homes are selling at or even above list price. My personal buyers have yet to write an offer on a home that did not end up in a multiple offer situation.